What Is Thermostat C Wire And What Color Is It Usually? Are you looking for the right smart climate control device? If yes, you should know that there is no “one size fits all” model for every situation, as each one has pros and cons of its own. They are all unique. Keep reading to learn which of the brands and models will meet your needs. Then choose the one that fits your home perfectly. Want some quick details about the five best models before you decide which one to buy? Here’s a detailed comparison chart I’ve prepared, just for you. Nest is the smartest thermostat on the market. There are other manufacturers with comparable devices, but they don’t match Nest’s learning capabilities. Within a week or two, Nest will learn your habits and routines. If the design of your device is among the most important things on your list, look no further. Nest offers a model that is stylish and high-quality, with a great look and design. People who have lower technical skills or who aren’t interested in playing with their device, and just want it to handle things for them. People who have regular schedules, because learning patterns are a big part of what makes Nest so smart. If you don’t have a C wire as a part of your HVAC system and you don’t want to put one in, the Ecobee thermostat is a great option for you. The Power Extender Kit (PEK), comes free with the device. It offers a reliable power source for homes without a C wire. Remote sensors are another advantage of Ecobee when compared with other brands. If you’re in a big house you can get a lot better climate control that way, because other devices only take in data from one place. With access to a free, personal Web Portal, Ecobee gives you insights and impressive data. Other brands don’t match the level of reporting experience this device offers. Choose this thermostat if you live in a big house, because of its capabilities. If you’re a data geek who’s hungry for reporting like I am, the Ecobee will give you the statistics and insight you’re looking for. If you’re looking for a thermostat that works with your budget but still gives you valuable and important features, the Honeywell Lyric T5 is the most logical solution. It’s inexpensive but has great benefits, and after looking through all the available models it’s the best budget-friendly choice when it comes to getting the most for your money. Keep reading for a detailed review of each of these devices. Before you decide which is the best wi-fi model for your needs, there are thermostat ratings and other things you’ll want to consider. By doing that you’ll be on the right track to the best device for your needs. One of the most important steps in choosing the best option is to see if the model you’re considering will work with your heating, ventilation, and air conditioning system. If the device isn’t HVAC compatible with your particular system, it’s not the thermostat you want to buy. Here’s one important note, as well. High voltage systems like electric baseboard heaters (120/240v), are not compatible with any of these wireless thermostats. Reading wifi thermostat reviews will show that these thermostats need a C wire, which is also called a common wire. This gives them a steady supply of power, allowing the continuous flow of 24 VAC power they require. To understand more about the C wire, I’ve written an article you can check out. Can Nest Work Without a C Wire? Yes, Nest can and does work without a C wire. But it pulls power from your HVAC system in a method commonly called “power stealing.” Doing that forces it to rely on a rechargeable battery that’s built into the unit. Ecobee also works without a C wire, but it has a unique way of getting around the issue that doesn’t involve it stealing power from your HVAC system. Instead of having batteries, the company provides a Power Extender Kit (PEK). This is a little device that gives the device a reliable power source. When the Ecobee is being installed, the device goes between the thermostat wires and the HVAC control board. You need a C wire to use the Honeywell Lyric T5. It doesn’t have a battery or a power extender. You’ll need an HVAC unit with a C wire, or you’ll need to install one if you want to use this model. Another of the steps you’ll need to take is to ensure your new thermostat is going to work properly with your smart home products, such as automation hub and other gadgets. Both the Nest and the Ecobee will work with Amazon Echo. If you own an Echo already, you can use Alexa’s voice control for your thermostat. The Honeywell Lyric T5 will also work with Echo. With the Ecobee4 model, Ecobee went further and integrated Amazon Alexa Voice Service. That means you can use your Ecobee4 just the same way you would use your Echo. This is the weak spot for the Nest, as it doesn’t offer Apple HomeKit support. This fact could make many people who already use Apple HomeKit choose another thermostat brand instead of Nest. Since Nest belongs to Google and big brands are always rivals in the market, we probably won’t see Nest supporting Apple HomeKit anytime soon. If you’re focused on Apple HomeKit integration with your wi-fi thermostat there’s little to consider. You’ll need the Ecobee, which is Apple HomeKit compatible. Then you can control the Ecobee thermostat with the Home app and Siri. If you’re thinking about buying a Honeywell Lyric T5, you should know that it’s also compatible with the Apple HomeKit, too. The Ecobee and the Nest are both compatible with the Google Home, so you can use Google Assistant and its voice commands to control your thermostat. You’ll be able to do that with the Honeywell Lyric T5, as well. Both the Honeywell Lyric T5 and the Nest are not compatible with Samsung SmartThings. If you want to integrate with that system, you’ll need to choose Ecobee, instead. How Much Money Does a Smart Thermostat Save? The producers of the top wi-fi thermostats market their products on a lot of different merits, including how much money you can save on your energy bills. With analyses they have conducted, they can back up their claims. How Much Will the Nest Save You? Nest published a white paper dealing with energy savings. According to that paper, users can achieve significant savings of as much as 10 to 12 percent on heating and 15 percent on cooling. Based on the energy costs that are typical for Nest users, they saved an average of $131 to $145 every year. That being said, the Nest thermostat will have paid for itself with just two years of use. It also earned an ENERGY STAR® rating in 2017. According to Ecobee, customers save about 23 percent on heating and cooling through their wi-fi thermostats. Every Ecobee model has the ENERGY STAR® certification, so they’re backed by the US government as being energy efficient. Plenty of users report their Ecobee savings, and claim they received a lot of savings on monthly bills by using this wi-fi thermostat. Of course, every individual is different and so is their rate of savings. You could experience more or less savings on your power bill, as there are many factors when it comes to energy usage. 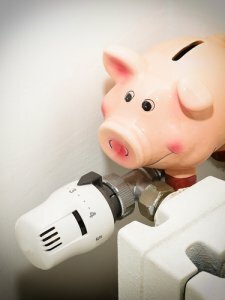 Honeywell makes the claim that its models save money on energy bills. They offer an online savings calculator, so you can find out how much you may be able to save with the model you choose, based on your location. When you focus on home thermostat reviews, one of the important things to consider is that you gain the opportunity to control the climate in your house from far away through your phone. This feature is offered in all models I compared. For every one of them there is an app for Android and iOS, so that it can be used on a mobile device. Pluses for this particular model include learning capability and a top-notch design. 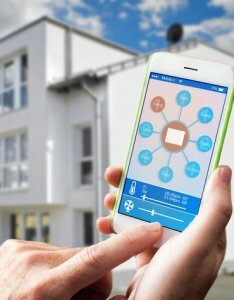 Minuses include no integration with Apple HomeKit, the lack of a remote sensor, and only being able to get access to the past 10 days of energy usage. Learning to install Nest isn’t too difficult. Everything you need is in the box, right down to the screwdriver. You’ll need about 30 minutes to get it put on the wall, and you can get 24/7 support on the phone or through online chat. That can be very handy if you’re not sure about installation. Learning is what sets Nest’s models apart from wi-fi thermostats created by other companies. It’s the smartest thermostat on the market. Within one or two weeks of use, the Nest starts to understand routines. But that’s not where it stops. Nest continues to learn beyond that time frame and detects patterns more easily the longer you use it. For people with regular schedules, this is a great choice for a wi-fi climate control device. People who don’t have these kinds of schedules, though, may find that Nest’s learning feature doesn’t work as well for them. With an unpredictable schedule, Nest can’t learn patterns, because there aren’t any. If you don’t want to be bothered with programming your device, the Nest will learn to do things on its own. Of course, you can change it manually any time you need to, as well. Nest can do even more, though. It can also determine the length of time to warm your house up, or how it can help your HVAC system be more efficient. Algorithms in the thermostat are figuring things out in the background, so Nest continues to work even better over time. As I’ve mentioned, Nest is the king of the thermostat design world. Competitors are not able to match the stylish look and elegant appearance of the Nest. The round design is striking yet timeless, and the thermostat comes in a choice of four colors. You can get it in copper, stainless steel, white, and black. With a 24-bit color LCD screen that’s 2.08 in (5.3 cm) in diameter and offers a 480×480 pixel resolution, the Nest is easy to look at and easy to read, too. Nest uses “power stealing” to work in houses that don’t have a C wire. That way, it’s getting power from your heating or cooling system. But this type of power usage doesn’t give a continual source of power. It needs a built-in, rechargeable, lithium-ion battery. The method works, but I can’t really recommend it if you don’t have a C wire to hook it to. To get a more reliable system, you need a C wire installed. This particular feature uses a sensor in the thermostat and the location on your mobile device to decide if you’re home or somewhere else. Essentially, the Home/Away Assist feature thinks your phone is you, and if the phone is home you should be home, as well. The thermostat will change its behavior based on where you are, and the temperature will get adjusted when you leave the house and when you return. Keep in mind that the Next also uses activity sensors to tell if there are people in the house. If you have a family account you can expand this feature, too, and add up to 10 other members of your household. Each one of them can set the Home/Away Assist feature to use their location. That way the device won’t switch itself to Away mode unless everyone leaves the house. When one person returns, the thermostat goes back to Home mode. Nest won’t track where you’re going. It only knows if you’re home or not. One of the best things about Nest is that they make things besides thermostats. These include Nest Cams – a family of indoor and outdoor cameras. There is also Nest Protect, which is a smoke and carbon monoxide alarm, and Nest Secure, which is an alarm system. All of these Nest products are able to talk to each other and respond to things that are happening around them. As an example, if the Nest Protect detects carbon monoxide, the Nest Thermostat will turn off any fossil-fuel powered heating. There are many other smart home products that are labeled with the “Works with Nest” logo, as well, so you can have a large number of synchronized smart devices. Nest thermostat users get emails every month that gives them a summary of the energy they used the month before. To make things interesting, Nest has also created Nest Leaf, where a Leaf symbol will appear on the thermostat when you’re choosing an energy-saving temperature. Your home report will give you information on the number of leaves you’ve collected, along with other things, and how your energy usage and savings compare to the national average. You can use the Nest app to check the energy history of the thermostat, but you can only see a detailed summary of the last 10 days. It’s one of the areas where the Nest falls a bit short. Is Nest the Right Model For You? If you aren’t bothered by the few negatives that Nest has, then this thermostat should be a great fit for your lifestyle. It’s especially good if you’re looking for a plug and play solution so your smart thermostat will handle all the thinking for you and your household climate needs. With the E model, Nest has significantly cut the price while keeping the vast majority of the features. But there are some differences that have to be addressed. It’s important to look at what Nest has changed with this particular model so they could offer it at a lower price. 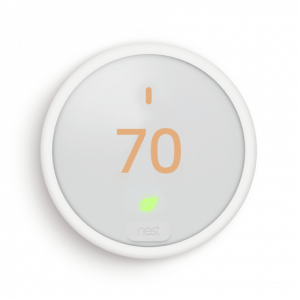 The Nest Thermostat E is made from polycarbonate, which is a plastic-like material that is not as high quality as the stainless steel of the Nest Thermostat. Reviews of this model may also mention that there is no color variety, which is not necessarily a bad thing. This model only comes in white. This model has a smaller screen with a lower resolution. It offers a 24-bit color LCD screen that’s 1.76 in (4.5 cm) in diameter, with a 320 x 320 pixel resolution. There is a frosted overlay that’s designed to help the Nest Thermostat E blend into the wall. It provides a soft, calming effect with a warm glow that makes the display look like a watercolor. Farsight is the Nest Thermostat feature using far-field sensors to determine when you walk by. Then it lights up the display to show you information. It can provide you with temperature, time, or weather. But the E model doesn’t support this particular feature. The Nest Learning will work with 95 percent of 24V HVAC systems, but the Nest Thermostat E doesn’t work with very many of these systems at all. The main reason for that is that the Nest Thermostat E only has 6 wire terminals, while the Nest Thermostat has 10. There is a one-year warranty on the Nest Thermostat E, while you get a two-year warranty on the Nest Thermostat. That adds significant savings to the E model. Most users won’t actually mind, but the Nest Thermostat E doesn’t come with a screwdriver in the box like its bigger brother. So, Should You Buy This Model? If you really like the Nest but you can get by without all of the fancy features, choose the Nest Thermostat E and save a lot of money. You’ll still get most of the same features, without missing out on too much. There are several pluses to the Ecobee4. These include having remote sensors, superb reporting, a three-year warranty, and a Power Extended Kit (PEK) that provides a great solution for systems that don’t have a C wire. The main downsides to this thermostat are its lack of learning capabilities and the fact that it still can’t match the Nest Home/Away feature. Read my in-depth comparison of Ecobee and Nest models here. When it comes to getting the installation right, there are detailed videos created by Ecobee to guide you through the entire process. On their website, you can locate everything you need to know to install your Ecobee4 thermostat. But here’s one important note. Ecobee doesn’t offer the 24/7 support that Nest has. You can check their support page to learn what hours they can help you. Ecobee doesn’t learn the way Nest does. Instead, it relies on schedules that you create for it and geofencing to determine how to efficiently control your home’s climate. Ecobees offer a 3.5-inch, full-color LCD touchscreen, with a 320 x 480 pixel display resolution. It’s made from plastic, with a sleek, modern design. It’s futurist, but not as amazing as the Nest, in my opinion. However, it’s getting closer. When it comes to power, you won’t have to worry about it stealing from your HVAC system. Instead, it comes with a Power Extender Kit that offers you a reliable source of power if your system doesn’t have a C wire. There are no built-in batteries in the Ecobee like there are in the Nest, but you’ll get the PEK in the box. You don’t have to purchase it separately. You’ll install the PEK between the HVAC control board and the wires that go out to the thermostat. It’s the best solution on the market for solving the power issue if you don’t have a current C wire and you aren’t interested in having one installed. Geofencing essentially sets up a virtual fence all around your home. That way, your Ecobee4 knows when you’re coming home and when you’re leaving. As your smartphone crosses the fence, your thermostat responds with programmed action(s). It lowers the temperature when you’re gone, for example, and raises it when it knows you’re coming home. In 2017, Ecobee integrated geofencing for Android, previously it was available only to users of Apple products. But it still doesn’t match Nest’s Home/Away features. Users of Ecobee and Android phones still rely on setting up geofencing for multiple people through IFTTT and Life360. Out of the box, only Apple users with iOS 11 and beyond can geofence multiple phones. Additionally, this Ecobee model has the Smart Home/Away feature that uses thermostat sensors and remote sensors to see if you’re home during a normally scheduled Away period (or vice versa). It will then automatically override your schedule. There is also a YouTube video you can use to learn how Ecobee Smart Home/Away works. With the Ecobee4, you get an additional remote sensor you can place anywhere in your home. You can also buy more sensors, to put in more locations. That helps give you better data calibration, to control your home’s climate more easily. It’s possible to use up to 32 sensors with your thermostat. There are both temperature and occupancy sensors on these remote devices, serving as satellites for the main thermostat. That helps make it smarter, because it helps it see what the temperature is in other places throughout the house. If you’re in a large home, this can make a very big difference in whether your thermostat understands your house’s temperature needs so it can control the climate properly. When compared to other brands, Ecobee really shines where reporting is concerned. Through accessing the Ecobee Residential Web Portal, you are able to view the usage history for your thermostat along with reports that address the efficiency of your HVAC system. Part of what helps provide these reports is the Home IQ usage monitoring tool. It takes raw data from your HVAC system and turns it into valuable insights about the HVAC equipment in your house. When accessing this information, you’ll need to use the web portal specifically. You can’t get to the reports from the mobile app. As the only model compared here that offers Alexa Voice Service, the Ecobee4 is ahead of the curve. You can use it just like you would use an Echo. You can ask it to adjust the temperature, add things to your shopping list, play music, and more. One important thing to note, though, is that Alexa calling and messaging, along with Spotify, are features that this device isn’t currently supporting. Another thing to consider is that, if your thermostat is located in a hallway where you don’t spend a lot of time, those features are going to be harder to make use of. If you want a good warranty on your smart wi-fi thermostat, Ecobee is an excellent option. Any Ecobee model gives you a 30-day money back guarantee, along with a warranty for three years from your purchase date. Is the Ecobee What You Should Buy? If you don’t mind the few negatives, and if you want a thermostat that solves the challenge of not having a C wire, then the Ecobee could be a great fit for your needs. When you want a smart thermostat but you’re looking for something that’s easier on your budget, the Ecobee3 Lite could be the best wireless thermostat for your needs. You get the majority of features that come with the Ecobee4, but you’re going to have to give up a few things. I’ll cover those here. That’s because the “ACC” and “ACC+” wire terminals that would be used for this accessories are not a part of this thermostat’s configuration. While Ecobee3 Lite does support remote sensors, you’re not going to get any sensors with your purchase. You can buy them separately, and they come in packs of two. You won’t get Amazon’s Alexa integrated into this device, and you also won’t get a microphone or speaker. It’s 4.05 in x 4.05 in x 0.84 in, compared to the Ecobee4’s 4.29 in x 4.29 in x 1.03 in. The Ecobee3 Lite is missing the occupancy sensor the Ecobee4 has. So, Is It Too Lite? Is the Ecobee3 Lite the right model for your needs? If you like the Ecobee but you want to save some money, and you don’t mind not having a few of the features of the more expensive model, the Ecobee3 Lite is a great choice. If you want the most value in a smart thermostat for a price that’s still affordable, the Lyric T5 is the one you want to consider. You can read more about how Honeywell compares to Nest models in this article. Some users have reported that the quick install guide offered by Honeywell can be a bit unclear in spots. In addition to that guide, you can use this YouTube video to help you install your thermostat properly. This model’s design is nice overall, but the font style on the display is a bit outdated and could use an upgrade to look better. There’s no built-in battery in the Honeywell, but it also doesn’t rely on power stealing. If you don’t have a C wire, this model isn’t going to work for you. You can integrate Honeywell Lyric T5 with most of the popular smart home products. That includes Amazon Echo, Google Home, the Apple HomeKit, and IFTTT. You can also use Alexa or Siri to control this thermostat with your voice. One of the main features that makes this thermostat so valuable is the native geofencing it provides. It’s not aware of where you are specifically, but it knows if you’ve crossed over the geofence boundary. That way it knows if you’re coming home or leaving, so it can adjust the temperature accordingly. You can get reliable native geofencing performance with this model for an affordable price, and this type of geofencing works better than what Ecobee has been able to integrate into its thermostats. SmartHomeLab.net is a participant in the Amazon Services LLC Associates Program, an affiliate advertising program designed to provide a means for sites to earn advertising fees by advertising and linking to amazon.com. Amazon, the Amazon logo, AmazonSupply, and the AmazonSupply logo are trademarks of Amazon.com, Inc. or its affiliates.